The antislavery movement entered an important new phase when William Lloyd Garrison began publishing the Liberator in 1831—a phase marked by massive petition campaigns, the extraordinary mobilization of female activists, and the creation of organizations such as the American Anti-Slavery Society. While the period from 1831 to 1865 is known as the heyday of radical abolitionism, the work of Garrison’s predecessors in Massachusetts was critical in laying the foundation for antebellum abolitionism. 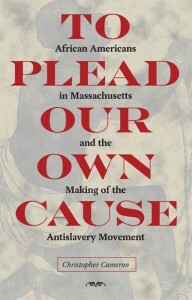 To Plead Our Own Cause explores the significant contributions of African Americans in the Bay State to both local and nationwide antislavery activity before 1831 and demonstrates that their efforts represent nothing less than the beginning of organized abolitionist activity in America. Fleshing out the important links between Reformed theology, the institution of slavery, and the rise of the antislavery movement, author Christopher Cameron argues that African Americans in Massachusetts initiated organized abolitionism in America and that their antislavery ideology had its origins in Puritan thought and the particular system of slavery that this religious ideology shaped in Massachusetts. The political activity of black abolitionists was central in effecting the abolition of slavery and the slave trade within the Bay State, and it was likewise key in building a national antislavery movement in the years of the early republic. Even while abolitionist strategies were evolving, much of the rhetoric and tactics that well-known abolitionists such as William Lloyd Garrison and Frederick Douglass employed in the mid-nineteenth century had their origins among blacks in Massachusetts during the eighteenth century. Christopher Cameron is an assistant professor of history at the University of North Carolina at Charlotte. He teaches courses on slavery and abolition, early American history, and American religious and intellectual history. He is currently working on a study of African American freethinkers from the late eighteenth century to the present.